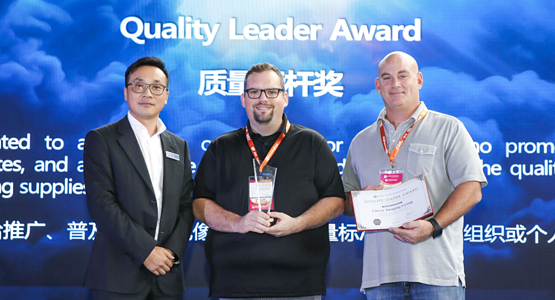 Clover Imaging Group Selected for 2018 Quality Leader Award | Industry Analysts, Inc.
Chicago, IL — November 8, 2018 — Clover Imaging Group (CIG) recently received the Quality Leader Award from RT Media. CIG was recognized as a leader in the quality of products in the imaging and printing marketplace. The award presentation was hosted at the RemaxWorld Expo in Zhuhai, China. In order to be selected as the Quality Leader Award winner, Clover Imaging Group had to meet certain standards and expectations for product performance. CIG was recognized based on their ability to produce a product that consistently delivers quality performance. Clover Imaging Group’s remanufactured toner cartridges are the industry leader with a 99.6 percent success rate for color, as well as monochrome toner. E-commerce Leadership Award. These three awards showcase the superior customer experience CIG delivers on a daily basis. This trade show has been held in Zhuhai, China each year since 2007. The city was chosen because it is the world’s capital of print consumables. Centered around sustainable innovation, Clover Imaging Group (CIG) offers independent dealers, OEMs, and retailers a complete imaging and solutions platform. CIG’s broad array of products and services includes award-winning remanufactured printer cartridges and parts, a comprehensive suite of managed print and technology services, and unparalleled marketing and sales support. Far from its early beginnings as an ink and toner remanufacturer, CIG has evolved into a global enterprise backed by a world-class engineering, manufacturing and distribution infrastructure. These expansive capabilities enable CIG to provide a level of partnership unsurpassed in the aftermarket imaging space. This entry was posted in Clover and tagged Clover, Quality Leader Award, RemaxWorld Expo by IA Staff. Bookmark the permalink.